Jamey and I have been married for 14 years and in that time we've gone from baby-faced recent college graduates to mid-thirty-something grown-ups with three kids and our fair share of grey hairs. In the nicest way possible, it seems like we've been married for a very long time. My pre-marriage memories are foggy. Like, really foggy. I know there was a time when I slept alone in bed every night, when I signed my name without a hyphen and told my parents where I was going when I headed out the driveway. But all that seems so very long ago. Our early days of marriage seem so distant, too. We were the same people then as we are now, but were we? Really? It's amazing how we've changed- our interests, our dreams and goals, the way we like to spend time together, the way we spend money, the things we talk about, and, of course, even the things we argue about. Sometimes it feels as if we've lived a lifetime already- me flexing from part to full-time and then back to part-time due to the stressors and anxiety of doing social work in a psych hospital (getting bit, having furniture thrown at me, and mourning the loss of a former client who took her own life), the threat of infertility followed by the loss of two babies to ectopic pregnancies, becoming parents and figuring out what that meant for our alone-time (less of it) and our couple-time (pretty non-existent), surgeries, becoming a family of four and then five in the midst of four years without a job while Jamey went back to school full time, moving from a townhouse where we weren't allowed to hang laundry outside to a little farmette with chickens, a garden and no garage (who have we become?!). All those experiences, shared together, have morphed us into different people and into a different couple. Thankfully, and by the grace of God, we still get along with our morphed selves. 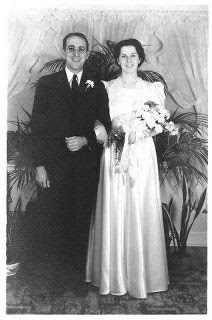 Happy Anniversary, Grandpa and Grandma. This is a very funny and sweet post. What a nice way to honor your grandparents. A very well written, lovely post, Jane. Blessings to your grandparents on their anniversary. What a wonderful tribute! I'm sure they are very proud of you and your family! Dave is very fond of his aunt & uncle. We just celebrated our 48th last week...70 seems a LONG time in the distance! So beautiful...my grandparents were married 69 years when Noni passed away. It's such an accomplishment...true dedication. Well goodness...I think my post disappeared. Happy, happy anniversary and hope your Grands celebrate more years of happily wedded bliss. It's hard work, yet rewarding, and they are a blessing, even to those who don't know them. They've stayed the course...wonderful! My Mom and Daddy celebrated their 60th in October...another wonderful, Christian couple who lead by example. I love this post. Love it. Congrats to you, and to your grandparents. This just really warms my heart. A goal to strive for! My husband and I just celebrated 17 years. We have 5 children ages 13, the twins, 12and 10, girls, and a son who turned 2 in Dec.